Even removed the section of dash cover under the steering column, above the brake and gas pedals, to try to get a better view above/behind/left of the fuse box. Wonder if the '99 Ironman uses some different kind of relay/flasher module? Behind the fuse box I found 2 black plastic modules with bundles of wires plugged into them. They are about 2 or 3 times wider than the relay/flasher in the photo. Any photos of a VX relay/flasher plugged in under the dash? Seeing that sure would help pin point the relay/flasher. TIA. If you flasher is working turn it on and feel underneath the dash near where your left leg would be if driving. It is tucked up there pretty high among other similar looking relays and fuses. The only way for me to tell them apart was to turn the flashers on and feel which one was clicking. If I am remembering correctly you pull it out towards the back of the car for removal. I put a LED flasher in I ordered from VLEDs and never had to worry about the resistors or fast flashing with LEDs again. No photos of the flasher relay plugged in under the dash. I didn't take anything apart to get the flasher relay out. Basically reached up just about as far as I could under the dash and behind the fuse box. 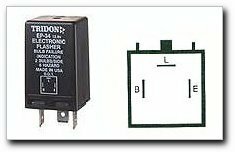 My OEM relay was smaller (shorter and not quite as wide) than the Tridon EP34 module and is labeled 'Flasher', 'Denso', 'FL257EB'. Amazon claims this fits the 1999 Vehicross so it seems you may have the same relay/flasher. Perhaps it's in a slightly different location? I'd wager the flasher was probably in too clear of view, couldn't see the forest for the trees type of thing. Tried turning on the hazard warning flashers a few times, could hear the general location of the flasher, but couldn't feel anything clicking. Excellent suggestion, though. Garage getting pizza cooking hot, so will give it another try in the morning. Managed to severely break several ribs in a fall a few years back. They've healed, but my contortionist days ended as a result. Will wimp out and let a professional replace that flasher. Thanks for the suggestions and advice. Was surprised to see how much smaller the OEM flasher was compared to the Tridon EP34 module. The OEM flasher looked less than half the size of the Tridon. Alltech installled my Tridon EP34, which is working fine. Doubt I would have ever found that tiny OEM module. I take it by installing this new relay it lets you use LED bulbs for the front and back turn signals? With out the car thinking one of the lights is out? Also, do you have a link to where I can buy this relay? Thanks! What if the hokey pokey is what it's really all about! Bought my Tridon EP34 Flasher at www.amazon.com for $12.61 with free shipping. My turn signals and hazard flashers work great. The flash rate is slightly faster than with the stock flasher and incandescent bulbs. The slightly faster flash rate is excellent with LED lights, because the LEDs turn on and off instantly, unlike incandescent bulbs that take time to heat up and cool down with each flash. I see the price went up a bit to $12.83 and "free shipping" now requires $35 worth of purchases. Check the "other sellers" - Partsense has it for $12.31 with no-strings-attached free shipping. Well I just swapped mine today. It is a PITA to get your arm way up in there, and to get enough leverage to pull it out. The new one doesn't have a nub to lock in place, but it works. LED or not, it works the same...but it won't warn you when a bulb is out (standard for these). It pulls out straight towards the back of the car. The "middle" prong faces the left side of the vehicle when you plug it in, FYI. I couldn't even see the socket when I pulled it out, I had to rely on how it was in my hand when I took it out to know. CF13-JL02 worked. There's a bunch of listings for it.